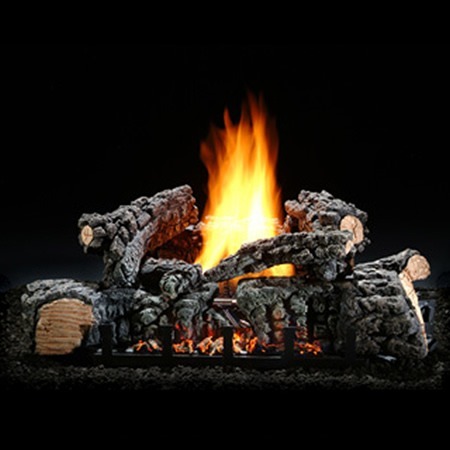 Log Size Choose an option22"26"
The Highland Glow Ventless Gas Log Set combines glowing embers, heavily charred, glowing ceramic fiber front logs and wonderfully detailed refractory top logs, to give your family’s hearth a lovely fire and plenty of cozy winter comfort. 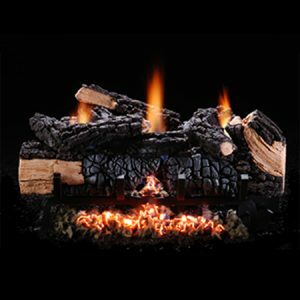 The Highland Glow Set has a low profile dual glow burner system and is offered in two sizes, 22″ (for use in fireplaces where most 18″ to 22″ sets will fit) and 26″ (for use in fireplaces where most 24″ to 30″ sets will fit). When used with a natural gas configuration there is a maximum BTU ratings of 32,000 (22″ size), or 40,000 (26″ size) and when used with a propane configuration there is a maximum BTU rating of 32,000 (22″ size), or 33,000 (26″ size). This set operates as unvented room heaters when used in a masonry or manufactured fireplace with the flue damper closed or with Ventless fireplaces. Because the Highland Glow is dual listed it may be operated as a Ventless set, or may be operated as a vented log set, in a wood burning fireplace with the chimney flue damper fully or partially opened. Ships with 7 to 10 days.